(VCP/Hamburg) – The German Protestant Church Day (Deutscher Evangelischer Kirchentag) in Hamburg was the background for a very special meeting this week: Protestant Scouts and Guides from the Verband Christlicher Pfadfinder und Pfadfinderinnen (VCP, one of the National Scout Associations in Germany) came together with Muslim members of the Bund Moslemischer Pfadfinder und Pfadfinderinnen in Deutschland (BMPPD) for an interreligious ceremony during which the Christian “Peace Light” met the Muslim “Flame of Hope”. 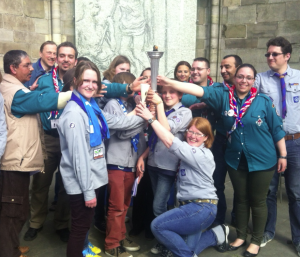 Carried by a former Olympic torch, the “Flame of Hope” has been travelling through Europe for more than two years now. Initiated in autumn 2011 by members of “Scouts musulmans de France” (one of the National Scout Associations in France), the “Flame of Hope” was recently brought to Germany. 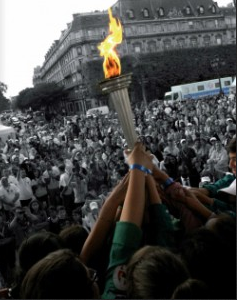 “The “Flame of Hope” is a welcome symbol helping our young citizens to better understand our country’s recent history,” explains Fouad “we hope that its warmth and brightness will help eliminate prejudices and barriers across our society. We all want to live together in peace and harmony, respecting our cultural and religious differences. That’s what flame and hope stand for.” Accompanied by young members of BMPPD, the flame will continue to travel trough Germany and is expected to reach Berlin on 3 October 2013, when a “Flame of Hope Charta” will also be presented. Make sure not to forget to light your own candle with the “Peace Light” when it will again be brought to your neighbourhood in December 2013. 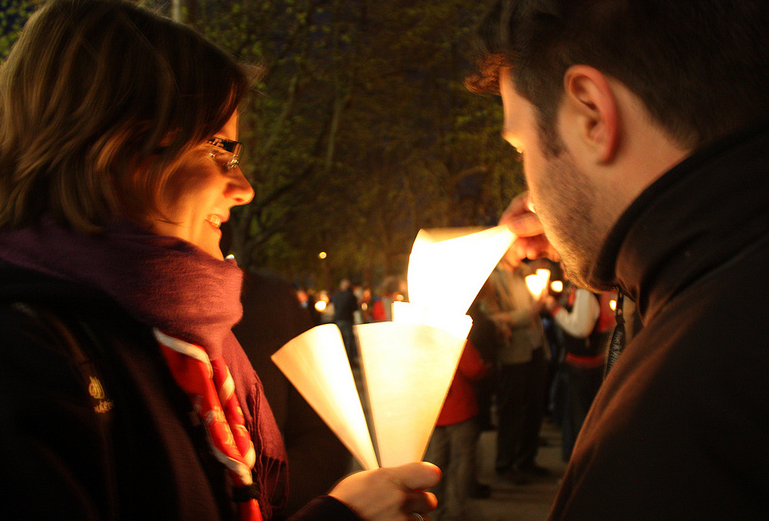 And why not join one of the “Flame of Hope” ceremonies between now and October?